Today’s investing idea takes us to Mexico, where a small company has quietly become the world’s leading producer of light vehicle leaf springs, and the top provider of suspension components for light trucks in the Western hemisphere. Sanluis Rassini made its first sale to Ford’s Mexican operations in 1938 and began exporting to the USA in 1970. Sanluis spent the 80s and 90s adding plants and offices in Mexico and the United States, and expanding into Brazil. From 1988 to 2013, Sanluis grew its revenues at an astounding 19% annually. However, for most of that period, Sanluis was hampered by a crushing debt load. This debt load lead to a default and restructuring in 2010. Sanluis emerged from the restructuring with a strengthened balance sheet and has continued to reduce its net debt, both in absolute terms and relative to EBITDA and cash flows. Results at Sanluis have climbed to record highs, powered by the strong sales of light trucks like the Ford F-150 and the Chevrolet Silverado. Sales growth for light trucks has outpaced the recovery in small automobiles, and the trend seems likely to continue as the US labor market improves. Results at Sanluis’ Brazilian subsidiary have lagged, but could provide an additional tailwind when and if the Brazilian economy recovers. Despite its reduced leverage and bright business outlook, Sanluis trades at very low multiples of EBITDA and EBIT, and offers a double digit free cash flow yield. Since the lows of 2009, Sanluis’ revenues have nearly doubled, topping $900 million USD for the twelve trailing month period. Forward revenues should be considerably higher. According to data provided by the Wall Street Journal, US pickup truck sales volume rose 3.6% year-to-date through May versus 2013, strongly outpacing cars. Sanluis’ components can be found in eight of the top ten selling pickup trucks in the US, so the sales increases are benefiting Sanluis’ results. To wit, revenues for the first quarter of 2014 were up 20% year over year. The chart below summarizes Sanluis’ results from 2009 to present. Amounts are in millions and are translated to USD at $1 USD: 12.91 MXN. Sanluis’ margins have cooled off a bit since 2009 and 2010, but have stabilized at levels comparable to US-based auto suppliers. For the first quarter of 2014, Sanluis reported EBITDA of USD $30.8 million. This increase came solely from strong activity in North America, as EBITDA at the company’s Brazilian subsidiary fell 48% year over year as the Brazilian economy slowed. At this pace, Sanluis is on track to produce USD $123 million in 2014 EBITDA. I expect quite a bit more, as the US market for pickups continues to improve. Any improvement in Brazil’s results would simply provide an additional tailwind, though I don’t count on it in the short run. 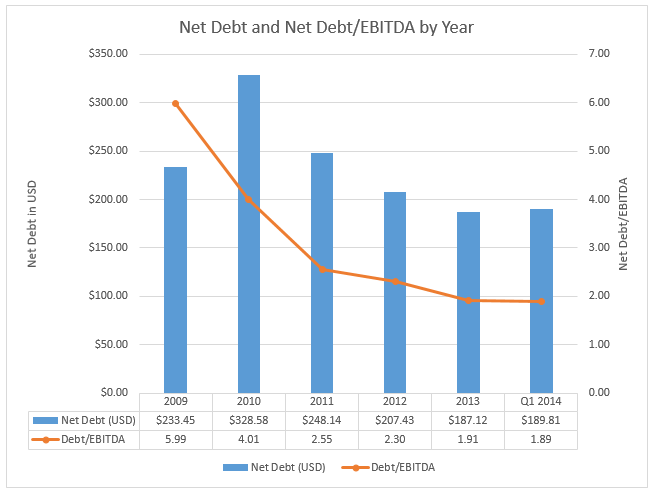 Below is a chart of Sanluis’ net debt in recent years, and multiple of trailing EBITDA that it represents. Since peaking in 2010, Sanluis’ net debt has been reduced by 42.2% in absolute terms. More importantly, net debt has fallen from 5.99x EBITDA to only 1.89x on a trailing basis. If we annualize first quarter results, the company’s net debt is only a hair over 1.5x EBITDA, a thoroughly sustainable level. Sanluis has accomplished this improvement in its financial footing mostly via dramatic increases in revenues and earnings, but also by dedicating the majority of its free cash flow to debt reduction. For fiscal 2010 to 2013, Sanluis produced a total of USD $168 million in free cash flow and reduced gross debt by USD $113 million. Slightly over 44% of Sanluis’ gross debt comes due in December, 2014, but I expect the company to have no trouble refinancing the debt on as good or better terms, give then substantially better operating performance the company has produced since the original debt agreement was reached. The company’s next series of debt comes due in 2017. Now that Sanluis is on sustainable financial footing, it will be free to dedicate its free cash flow to growth investments or payments to shareholders. Due to the growth of the US market for pickup trucks, Sanluis’ results are highly likely to rise in coming quarters. For the sake of conservatism, let’s annualize Sanluis’ first quarter results to arrive at a yearly estimate of EBITDA and EBIT. Based on the first quarter of 2014, Sanluis is poised to report $123 million in EBITDA and $96.7 million in EBIT for 2014. However, these figures are slightly misleading. Sanluis has a 50.1% stake in its Brazilian subsidiary, which causes those results to be consolidated under standard accounting principles. However, half of the subsidiary’s EBITDA and EBIT doesn’t actually “belong” to the parent company. By the same token, half of the subsidiary’s debt must be taken out of the equation to arrive at a true measure of enterprise value. My calculation of the company’s liabilities included in enterprise value also bears some explanation. EBITDA and EBIT: Sanluis’ Brazilian subsidiary is called “Autopecas.” This business produced USD $4.0 million in EBITDA in the first quarter. The EBIT figure was not disclosed, but assuming the same margin as the company as a whole, Autopecas would have produced USD $3 million in EBIT. (In reality, it was probably lower as the sting of negative operating leverage was felt.) Annualizing these results reduces Sanluis’ estimated 2014 EBITDA by USD $8.0 million and its EBIT by USD $6.0 million. Net Debt: The Brazilian Autopecas segment has USD $12.8 million in debt. Adjusting this figure for Sanluis’ 50.1% stake in the business results in a USD $6.4 million reduction in net debt. 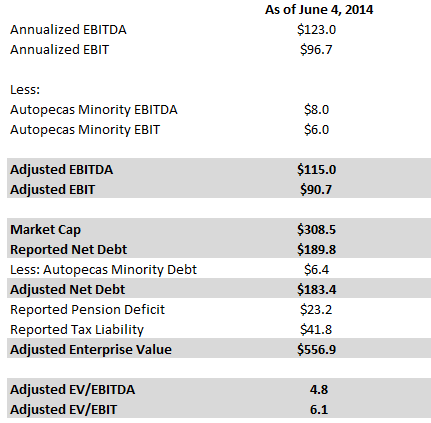 Autopecas likely also has some subsidiary-level cash, but this figure is not disclosed and I’ll ignore it. I’ve been fairly conservative in all my other assumptions. Pension deficit: Sanluis reports a pension deficit of USD $23.2 million, which I add to enterprise value. In most cases where a pension is involved, it is important to look at the assumptions involved. Sanluis uses an expected return of 7.5% on its plan assets. With a high-quality Mexican corporate bond index currently yielding 5.30%, the return figure is in the realm of reasonability. Other important figures like the assumed discount rate and expected salary increases are also reasonable. Special Tax Liability: In late, 2013, Sanluis was hit with a large increase in taxes payable due to a change in the Mexican tax code. These new taxes payable sum to USD $52.8 million and must be paid over the next five years. Using a discount rate of 10%, I’ve included the tax liability in enterprise value at a present value of $41.8 million. After all those adjustments, Sanluis’ projected 2014 valuation looks like this. At 4.8x projected EBITDA and 6.1x projected EBIT based on very conservative assumptions, Sanluis is about the cheapest auto supplier I’ve found. This despite Sanluis’ prime industry positioning in the hot market of pickup trucks. The market seems to be catching on to Sanluis’ progress, and shares have rallied quite a lot over the past few months. However, I think they have quite a way to go before they begin to reflect reasonable valuation multiples. There’s a lot more to the story with Sanluis, but that’s quite enough verbiage for now. I always welcome discussing any company I write about with readers, so feel free to drop me an e-mail or leave a comment. Alluvial Capital Managment, LLC holds shares of Sanluis Corp. SAB de CV for client accounts. How did you figure the market cap is $308.5mm? A shares outstanding is 178mm. CPO shares outstanding is 71mm. CPO shares actually represent two shares in one unit. For that reason, they trade at about twice the price of the A shares. Great article! Where did you find out about this company? I’m new to investing and trying to learn how to find good opportunities. Keep up the good work! I discovered Sanluis while doing a screen for high free cash flow yields. Did the research and really liked what I found! It seems that the company has huge tax liabilities. Is it right to only consider EBIT/EBITA when historically taxes have taken such large bites out of the company’s profits? Sanluis’ historical tax woes have been caused by regulatory changes in Mexico and Brazil and amounted to around $66 million USD at year-end. I did incorporate the tax liability into the company’s enterprise value in my post. In my opinion, Sanluis’ major tax issues are behind it, and the existing extraordinary tax liabilities will roll off over the next five years. Mexico’s corporate tax rate is 30%, and I expect Sanluis to be subject to a rate close to that going forward.